1) Clearly this is happening the field. 2) Clearly some engineers are doing this or, at the least, failing to recognize the problem if there is one. 3) There are situations where these diaphragms are of very small dimension perpendicular to the planks and, having stood on them myself, I can attest to their feeling quite robust even in the absence of a complete, all side vertical bracing system. 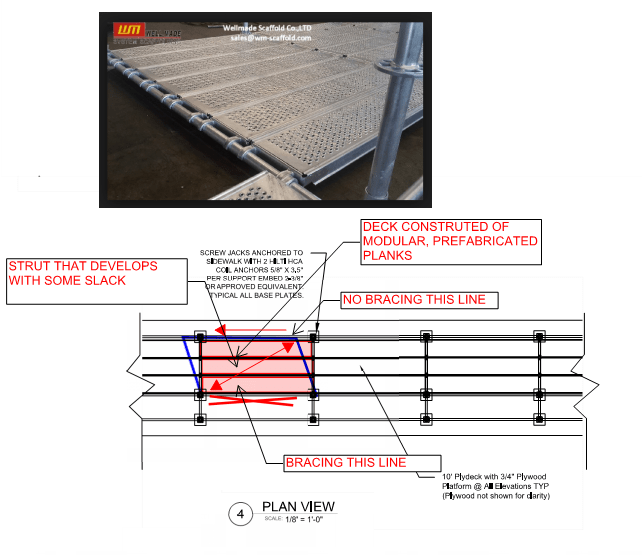 RE: Use Prefabricated Scaffold Planking (Ply Deck) as Diaphragm? So it seems like if there's lateral diaphragm shear, each individual plank has a pair of "claws" that grip the supporting cross pipe, resisting any deformation into a parallelogram shape. That would create a series of force couples that would work the shear into the cross pipes and limit that deformation, despite there being no direct shear connection between planks. Do I have that visualized correctly? That is one mechanism but not the one that I'd had in mind. The claws do not grip particularly lightly. 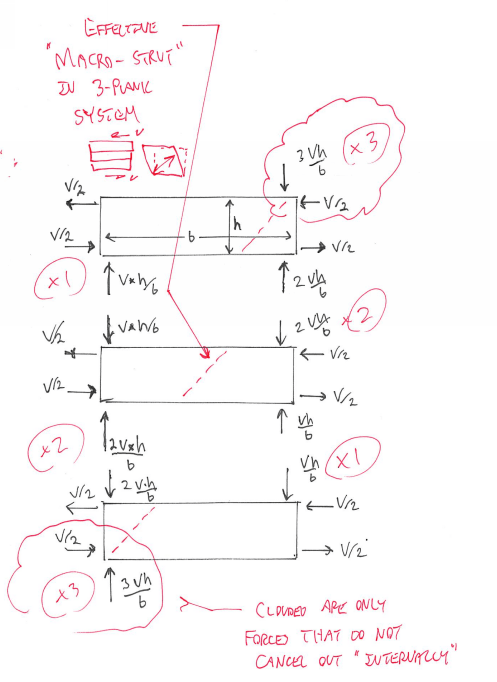 The mechanism that I had in mind was the diagonal compression strut shown in my sketch. Somewhat like a horizontal version of the masonry infill inside of concrete frame issue. Except here, I want it. But I think you almost need to look at each individual plank creating it's own separate strut, since there's no continuity between adjacent planks. And although your picture shows them nice and tightly packed against each other, you know damn well that is not necessarily how it'll be installed. I think JAE's load path is the most likely culprit. even without the tight grip. 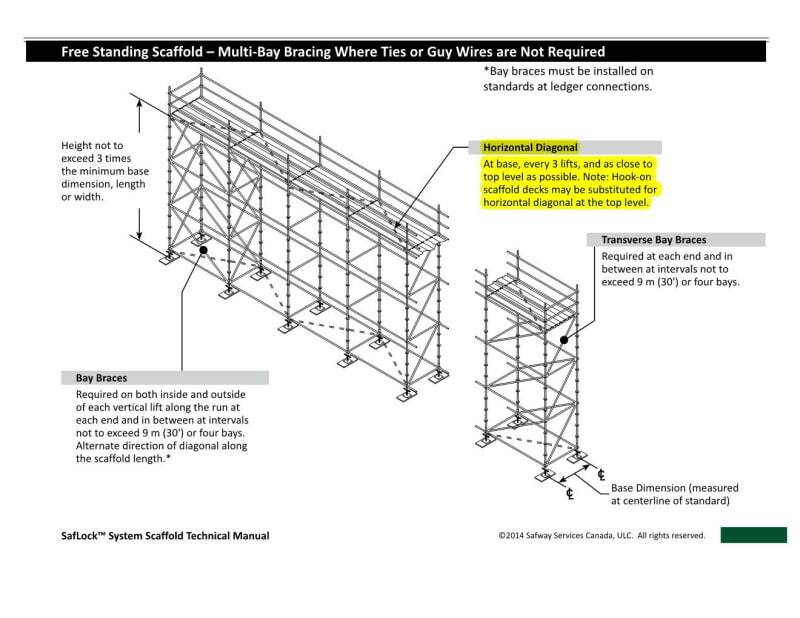 Having worked in the scaffold industry in the past, I found that many issues involving lateral loading / bracing are not necessarily well documented or even considered in design. For un-enclosed conditions, the analysis will typically only address the vertical leg load capacities, based on leg load tests to failure, with the minimum OSHA safety factors (typically 4:1). Lateral bracing typically reverts to OSHA Subpart L minimums, without any real analysis. Enclosed scaffolds will typically get a closer look, potentially using tube and clamp diagonal bracing from leg to leg to transfer the lateral loads. In terms of how the hook planks behave structurally, I would largely agree with JAE & jayrod12 that the best case scenario would be that if the planks were locked in leg to leg (which wouldn't necessarily be typical), there would be some diagonal transfer / coupling within a given plank, but not necessarily "compositely" across a group of planks. And in many jobs, 2x10 nominal plank are used interchangeably with hook plank in the field, and certainly I don't see any potential for diagonal load transfer for these conditions. I'd also agree that each plank would act individually; kind of like a wooden shearwall panel system. No idea how you would quantify how much compression that strut can take in a panel beyond a rough guess. I've used decking as a diaphragm successfully. See attached excerpt from the Safway manual that specifically allows it. If you've ever tried to put a scaffold deck on a scaffold that was slightly out of square you'd have an appreciation for how well the decking works. With that said, if you're spacing your lateral tie-backs unusually far (more than the typical 15'-20' horizontally) I'd have to re-visit the use of the decks as a diaphragm. A couple of other considerations - depending on the type of work being done, a decked level today may not be a decked level tomorrow, so you may lose your diaphragm partway through the project. If you add plan bracing below the decks, it turns into a head room issue if there is a decked level directly below. 1) I'd thought that JAE was describing moment frames of a sort but now see that he was not. 2) I understand that the planks are not continuous but was viewing the system en-macro as shown below and in the attachment. Each plank is FBD'd and, when you account for the forces that cancel internally, you get the effective corner to corner compression strut that I'd had in my head. Thanks for joining in. This is space where I absolutely value insider wisdom. I've got another scaffolding question going right now and will have several over the coming weeks. I hope to hear more from you as I go. Another of my questions will concern this. I find that many suppliers will interpret this to mean 4:1 with the base dimension being the width of the overall scaffold rather than the width of the braced bays. In my mind, it's gotta be the braced bays. And in many jobs, 2x10 nominal plank are used interchangeably with hook plank in the field, and certainly I don't see any potential for diagonal load transfer for these conditions. Agreed. I wouldn't attempt this were it not, as I described above, a system where I can be confident that it will be ply deck instead of 2X10. Perhaps add a non-substitution note to my drawings for good measure, not that anyone is likely to read it. ...Safway manual that specifically allows it. Just what I was looking for... thanks so much. That is sage advice that I will keep in mind. 1) Given the nature of the "claws", axial load in the planks will tend to lift them from the scaffolding. They have wind tie down mechanisms but I would need to rely on them being engaged. 2) As I see it, lateral live loads specified for scaffolding are, at least in part, p-delta loads. Given that a diaphragm like this will have some "take up", I wonder about the impact that will have on P-delta. Are you looking into this for general use scaffold, or some unusual loading? I'm a bit of a scaffold-junkie so I have to ask. I'm a bit of a scaffold-junkie so I have to ask. Really? We should talk. I aim to be the construction engineering king of Western Canada. Part of what makes it interesting is the paucity of information available. I have a list of pretty fundamental questions the length of my arm. As far as I can tell, I've already got every major reference published on this stuff (thank you UK) and there just isn't much out there. And most of what's out there describes very simple cases such as the one in the diagram that you posted earlier. These guys at DH Glabe seem to really have it together: Link. I've learned a fair bit from their faq's etc. I aim to be the construction engineering king of Western Canada. Just stay west of Toronto, we don't want any turf wars. Happy to talk scaffold anytime - you're right in that there isn't much info out there. Product catalogs are helpful. But by and far my biggest source of education on this topic has been from a senior engineer who had been in the scaffold game a long time and did some pretty amazing stuff with various scaffold systems. Second biggest source of education was dealing with the guys who put this stuff together - the guys I worked with were very creative and were great problem solvers - and there are a lot of proprietary scaffold products and systems that you might not even know about unless you learn about it from the suppliers. Just stay west of Toronto, we don't want any turf wars. Shouldn't be a problem in the foreseeable future. Unless I miss my mark, much of the profit potential, and the ability to service the work well, depends heavily on having boots on the ground in your target markets. I'm not 100% sure but DH Glabe appears to be one or two major production centers with all of the other offices essentially being sales/field reps. And that would make a lot of sense I think. Another observation that I now feel qualified to make is that, somewhat unfortunately for my business aspirations, this is not work easily handed off to junior personnel. Things are fluid and effective field review really seems to require the rapid application of seasoned judgment. Tossing an EIT out there seems like a recipe for angry clients and high turnover. And maybe crippled construction workers. You're absolutely right about this. Its difficult to draw every detail required to erect a scaffold, especially because they're usually being built in and around existing objects, and there will be things in the the way that weren't accessible in the planning stages (hence the scaffold). Site visits for large scaffold are full of on the spot judgement calls. It really pays to develop a solid working relationship with the contractor. Large scaffold projects always get me excited - there is a ton of flexibility with the major scaffold systems which lets you get creative with solutions...I always feel like a big kid with an awesome lego set when I do this work. You also get to visit some pretty cool places doing this type of work. Shouldn't be a problem in the foreseeable future. Better solution: join me. CANKOOT East. Unlike the other services that I've been attempting to foist upon the marketplace, there actually seems to be a legitimate demand for this stuff. Oh I'm fairly certain there's a high demand for guys/gals willing to provide construction type services. We do a bit of scaffolding and shoring designs in house, our problem usually is having the ability to drop whatever we're doing to help. The contractor's schedules usually don't allow for much design time for these type of items. So you'll need to turn off the in-depth Koot brain. The biggest thing I've come to realize in many of these types of projects, actual member sizing in general doesn't matter, what matters is how quickly can they get the design and materials, and how easy is it to erect. If you can live with running less numbers but leaving yourself some slop in the design to offset then it can be a profitable market. ..our problem usually is having the ability to drop whatever we're doing to help. Agreed, it does not play well with other work. Most of the larger EOR firms that handle this stuff in Canada do so through a dedicated "special projects" group for just this reason. You know, with "special" being code for small, unglamorous, and extremely fast moving. So you'll need to turn off the in-depth Koot brain. Yes, that is exactly the difficulty that I face. For some time now, I've felt that success in the business sense requires me to, effectively, not be me. We'll see how that pans out. If you can live with running less numbers but leaving yourself some slop in the design to offset then it can be a profitable market. Yep. To date, I've not yet seen a scaffold that I believe could resist code mandated lateral loads that would pass through the base plates at braced nodes. More on this in another thread. Excellent advice from jayrod12. For scaffold design, I usually start with a quick back of the envelope type calculation to get a ball park on the leg loads/lateral loads I'm dealing with. Once I have a feel for the loads, I put the calculator down and start drawing a solution that is practical and fits the site restrictions - calculator usually doesn't make it back on my desk until the picture is finished, and then I check some of the questionable locations that popped up while drawing the scaffold. There definitely is a high-demand for construction engineering (in my market anyway) - you have to be quick to respond, flexible, and be willing to work pretty close the structural limits of the temporary structure in order to keep your client competitive. This doesn't seem to be the comfort zone of a lot of engineers.